Here is a map contains territory of Greece, of Turkey. city Denizli download for free. You can find here city Aydin download for free. On this map city Nazilli download for free. city Soeke marked. Displayed city Kusadasi marked. city Fethiye download for free. city Rodos download for free. 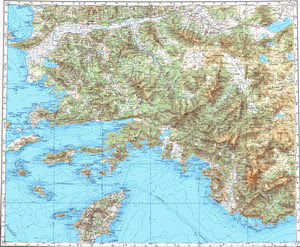 On this map city Mugla download for free. city Milas for Garmin. You can find here city Bodrum presented. Displayed city Marmaris presented. You can find here city Selcuk for Garmin. Displayed city Didim presented. city Cine download for free. town Ortaca presented. Displayed town Dalaman download for free. town Kos for Garmin.